SABA Relief and Development Charity was established in January 2012, with their sole goal to benefit and serve the needy in Yemen. SABA is a vital link between donors and beneficiaries, tackling the tremendous poverty that currently exists and putting a stop to the poverty spreading. This is mainly carried out by implementing and supporting various programs and projects throughout Yemen, reaching those in both rural and urban areas. SABA constantly addresses the bare fact that nearly half of the Yemen’s population survive on less than £2 a day. Depaul UK helps young people who are homeless, vulnerable and disadvantaged. In Sheffield, Depaul UK provides supported accommodation for young people, aged between 17 and 21, who have experienced homelessness or been at risk of becoming homeless. By providing accommodation and the support to develop skills to make this tenancy a success Depaul UK gives young people the safe base to start building their future so that we can start work to break down barriers which allow the pursuit of aspirations. Partners Relief & Development is a registered charity in Australia, Canada, New Zealand, Norway, the United Kingdom and the United States, working with communities impacted by war in Burma. GESIPR is registered charity based in Leeds. The organization is involved in working with vulnerable groupsof people in the community who are socially excluded or in poverty. This includes rehabilitation of offenders and ex-offenders, empowering refugees and asylum seekers through information sharing and skills training, supporting BAME women from low income households through referrals to specialist services and providing a one stop drop-in center where they can access other needed services in the community. SAWN is a womens charity working with migrant women in greater Manchester assisting with settling into the community, training, one to one support and prison work. North Notts Junior Snooker Academy has been running now for 6 years. We give the opportunity for disadvantaged, abled bodied and disabled youngsters to play snooker. We are a registered charity and a not for profit organisation. Spiritual Foundation (Charity No.1077482) is a charity that was established in 1996 which aims to promote peace and equality through the teachings of Sufism. Hambleton and Richmondshire CAB provides free, independent, confidential and impartial advice to the local community on issues surrounding welfare benefits, debt and money, housing, relationships, immigration, consumer and employment. The CAB is a registered charity and is staffed mainly by highly trained volunteers. Salisbury is unique amongst medieval English cathedrals having been built in just 38 years in a single architectural style, early English Gothic. The tower and spire were added about 50 years later. But it is much more than a historical monument. It is a living church and a place of prayer. As the Cathedral Church of the Salisbury diocese it is Mother Church of several hundred parishes in Wiltshire and Dorset. It is also a centre of pilgrimage for hundreds of thousands of visitors every year. Rotherham & Barnsley Mind has been providing community mental health support since 1977 and currently offers services to Adults in the community and at the resource centre at Amberley Court in Rotherham and Arcadia House in Barnsley via bespoke personalised care packages which may be funded via an individual budget subject to eligibility. Crossroads Care is Britain’s leading provider of support for carers and people with care needs. We work with over 35,000 individuals and their families, helping carers to make a life of their own outside caring. BCB was incorporated in April 2001, its main objective was to maximise training and employment opportunities for unemployed people in Barnsley, who were interested in developing a career in the construction industry. Disability Lincs Ltd is a county-wide organisation for people with disabilities. Our aim is to get as much information as we can out to the people who need it. Drive Forward Foundation is a charity with one mission: to equip care leavers with all the tools they need to take charge of their lives now and in the future. The charity runs a 10 week training course which is designed to help care leavers aged between 17 and 25 create their future. It covers four key areas: career development, independent living, self expression and discovering London. Green Furniture Aid has been able to give a Hertfordshire based charity a major boost by supplying chairs and tables for their new office location in St. Albans. HYH works across Hertfordshire supporting young people who are either homeless or threatened with homelessness, and have a number of services aimed at preventing young people having to endure the effects of no secure place to live. Barnsley Beacon Support Services supporting parents, relatives and friends of drug or alcohol users. BBSS are parents and carers who can offer confidential information, help and support to parents, families and friends who have concerns around drug and alcohol misuse. New Hope Food Bank is a mission of New Hope Community Church Killamarsh. Our aim is to show God's love in action and enable our community to help our neighbors to alleviate hidden hunger. Although based in Killamarsh we hope to service an area of up to six miles from Killamarsh. We will provide seven days worth of emergency food (donated by the public) to local people in short term crisis, for up to four visits. The recipients of the food will be referred by a front line agency such as Citizens Advice or the Job Centre. Amy’s House is a weekend respite facility that cares for children with special needs and their siblings. Working together with parents and carers, the dedicated staff use their qualified expertise to create a stimulating, educational and safe experience for the children entrusted to their care. The New Shoes Theatre Company is a provocative and vibrant theatre company which confronts social and environmental issues and produces powerful and inspirational work written by women. The organisation works alongside agencies that support women including Refuge workers and members of local Community Safety Partnerships. Hour-long discussions follow each performance and members of the audience can find out more about available local and national support for women, children and perpetrators of domestic violence. The BaYBI is a new and dynamic service designed to channel the latent skills, energy, interest and inclination to business that may exist in some of our young people who are currently Not in Education, Employment or Training (NEET) with a view to positioning them to become future entrepreneurs and also to reduce the amount of antisocial behaviour or criminal activity amongst this group. Services provided at the Youth Business Incubator will include practical help to set up physical and online businesses, support in running the business in the form of business mentors, marketing support, funding advise, assistance with registration and other necessary start up documentation. The centre will also be equipped with reprographics, virtual office services and other relevant facilities for training and meetings. In January 1995, Sandra Howard saw a TV program, which included news about a revolutionary new surgical procedure for treating severe Epilepsy. It was called Vagus Nerve Stimulation Therapy. In 1995 only one operation had been performed in the UK, although a number had been performed in the USA. Unfortunately the National Health Service could not fund the treatment at that time, but it was agreed that Gareth would be a suitable candidate. The £5500 needed for the implant would have to be raised but the NHS would meet the other costs incurred. The National Rheumatoid Arthritis Society (NRAS) is a small national charity based in Maidenhead, Berkshire. The charity was established 10 short years ago to focus specifically on helping people living with Rheumatoid Arthritis (RA). RA is an autoimmune disease that is often misunderstood and confused with osteoarthritis but is in fact very different and more debilitating. It strikes most often in the prime of life and there are 690,000 adults in the UK living with this painful disease. NRAS offers support to patients, families and health care professionals via a free-phone helpline, free publications on a wide range of topics relating to RA, an interactive and informative website and is the leading campaigning voice for people living with RA. Support Dogs is a UK charity dedicated to improving the quality of life for people with epilepsy, physical disabilities and children with autism by training dogs to act as efficient and safe assistants. 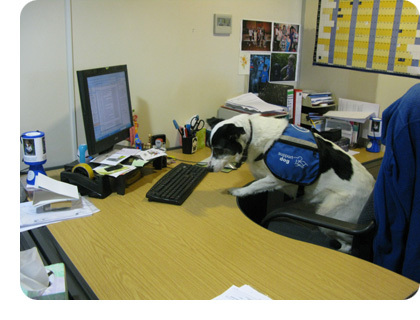 All dogs are trained to assist and support their owners with their specific disability. Each dog is taught tasks tailored to his owner's needs, enabling the disabled person to lead a fuller and more independent life. York and District CAB works towards alleviating poverty, injustice and inequality, which exist within our local community. This is achieved through the development of an effective, accessible and quality service. York and District CAB is committed to creating an environment that offers equality of opportunity and access to all its clients, staff and volunteers. The Royal National College for the Blind (RNC) is delighted to have received a generous donation of office furniture from the Green furniture aid in Sheffield. Established in 1872, the RNC is a specialist, residential college of further education for people aged 16 years plus who are blind or partially sighted and many have additional disabilities. As a charity, money gets tighter every year. Our fundraising priorities are for improving facilities for students and in the meantime, many of our staff are putting up with really old furniture in their offices. The photograph of our main teaching building shows that it is an impressive, old building and inside is a labyrinth of rooms and corridors. Some have been fully refurbished and others have lagged behind. 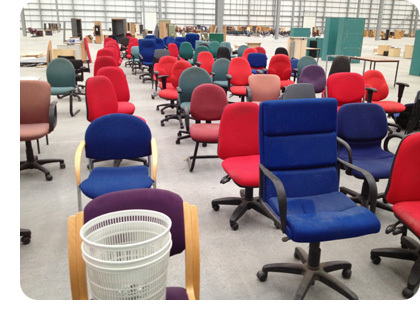 The college fundraising staff searched the internet for recycled furniture and found that a part of Green furniture aid in Sheffield undertakes office clearance projects and donates second hand furniture to charities in this country and abroad. We were so pleased to discover that, providing we could collect the furniture there would be no charge. 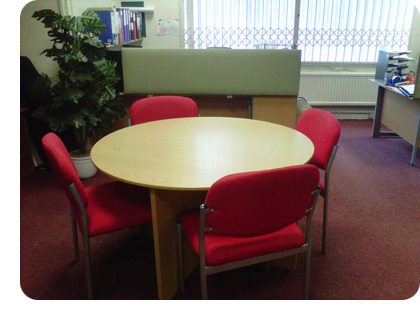 We have collected a number of desks, pedestal drawers and a table. Our plan is to replace older desks in various offices around the College and next year we hope to revamp our main reception area which is looking somewhat old fashioned if we can get a little more furniture from green furniture aid. The Really NEET Project (RNP) was formulated out of AW Education (AWE), a private training provider offering alternative education to NEETs in South Yorkshire. AW Education was constituted in 2009 and has since run 14 projects working with hundreds of young people, re-engaging them in education through practical, fun and unique techniques, making the education relevant and young person focused. AW Education was set up to strengthen and support the curriculum, helping teenagers to foster independence and motivating reluctant learners through engaging, practical sessions aiding in both personal and social development. We get teenagers engaging positively with education again through unique energetic sessions that are designed to engage children who have found themselves outside of the school system for one reason or another! We then set up the Really NEET Project, a social enterprise designed to continue the work of AWE through taking the projects a step further and offering longer, more intensive courses addressing some of the deeper issues faced by some of these young people with the objective being to keep them engaged long term and stop them from becoming NEET again. We now have a College Premises where we can offer alternative education to young people who have slipped through the education net through our accredited business courses, offering a supportive safe haven for young people to learn in way that suits them. Sport Stopped Sophie Running Wild! Sophie Maxwell is a shining example of what a bit of faith can do. A teenager spiralling into a life of homelessness and drug-taking, she tells Jo Davison how she found a saviour in a sports coach...She was a 14-year-old with a feral streak when he met her. But the young sports coach at Don Valley Stadium looked beyond the touch cookie act. A girl with intelligence and drive, just waiting to be channelled in the right direction. "She had this energy; a spark. The X Factor... whatever you want to call it," says Rob Creasey, the man who, without ever meaning to, ended up becoming Sophie Maxwell's mentor, adopted big brother... life-saver. He was a university student working as a volunteer at Don Valley stadium when Sophie strode in, announcing she wanted to be the next Kelly Holmes and asking for coaching. It was her survival instinct kicking in. The teenager living a life of truancy, homelessness and drug-taking had been watching the Sydney Olympics and it had fired her with a goal for the first time in her life. She became an athlete – from the age of 16 to 22 she competed for the City of Sheffield Athletics Club – and from 18 she began coaching, too. To everyone's amazement, the girl who had turned her back on education begged for a place on a sport and leisure course at Sheffield's Norton College. She passed with flying colours, then got herself a degree in leisure and events management at Sheffield Hallam University. While studying, she found out about the university's Enterprise Centre, which helps students turn their business ideas into reality, and decided on her next goal: to set up a system which would help young people experiencing the difficulties she had once faced. She founded Adventure Workshops Education, which now motivates reluctant young learners throughout the city. "I help kids who don't go to school to re-engage with the national curriculum," she says. "Recently, I gave a session which involved teaching Pythagoras's theorem in a field!" "I see myself in all of the kids and I hear Rob in my voice when I talk to them." Last week, Sophie's achievements were given national recognition. The homeless charity Crisis named her as one of its five Changing Lives Champions for 2010.The charity awards applaud formerly homeless people who have transformed their lives in the face of adversity and Sophie won two of its major accolades. Her adopted "big brother", who coaches and motivates other young people experiencing difficult times through his job with the council education department's extended services team, couldn't be prouder of her. But Rob isn't at all surprised: "I always felt that whatever Sophie set out to do, she would achieve. That she would make waves, not ripples," he says. "She is doing great things in this city and having helped her to find her path has been a really humbling experience." "I would like to take this opportunity to thank Terry Askew from Green Furniture Aid for the extremely kind donation of furniture for my Social Enterprise – The Really NEET Project. Without this generous donation we would be struggling to furnish the college as funding is becoming harder and harder to come by. This College will be key in helping many young people in Sheffield re-engage with education again and help them work towards a brighter future." Helen's Trust is a local charity which helps people with cancer and incurable illness to stay in their own homes. The Trust endeavours to fund various requirements in order to achieve this aim (e.g. nursing care, sitters, help to run the house, equipment care for others or complementary therapy). This help is available in the Derbyshire Dales and the North East of Sheffield. 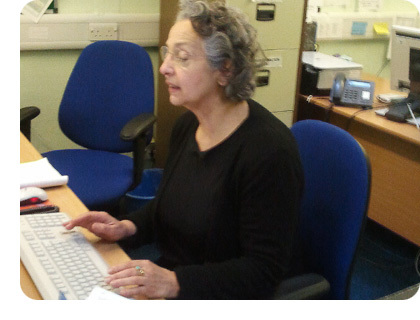 "I am writing to say a huge thank you for the furniture that Green Furniture Aid recently donated to Helen’s Trust. The furniture you gave us is essential in helping our charity to function in our new office and it will also help to support us as we continue to grow and develop further. Helen’s Trust is a local charity which supports people with incurable illness to stay in their own home when care and equipment is need. The charity works hard to support people by removing the barriers that may be preventing a person from staying at home. We can fund nursing care or sitting services, provide equipment such as special beds or chairs and even install stair lifts. Importantly, we pride ourselves on our ability to be creative in helping people and always try to assess and support what each individual needs to help them to stay in their home. I would recommend other charities and organisations look up Green Furniture Aid and see how they might be able to collaborate together." 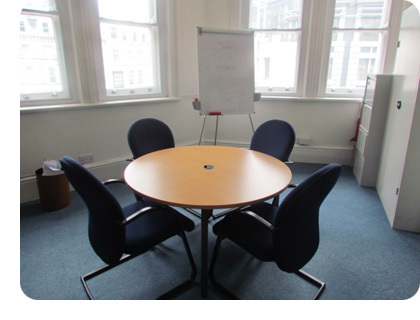 Green Furniture Aid provided the Al-Khair Foundation with a complete suite of recycled office furniture for their new offices in Sheffield. Al Khair is dedicated to alleviating hardships both at home and in some of the least served communities throughout the world by combating poverty, promoting education through IQRA TV (Satellite 826) and establishing schools, providing relief aid to areas affected by natural disasters and infrastructure assistance to improve and/ or rebuild basic public services. Al-Khair Foundation was established in 2003 to provide an educational platform for the Muslim community in an Islamic environment. From an initial enrolment of 5 students, the Foundation now operates a mixed primary as well as separate secondary boys and girls schools for over 200 students and is regularly oversubscribed for enrolment. The Al-Khair school routinely achieves the highest Ofsted accreditation and is currently within the top 3% of schools nationwide for the quality of its teaching and academic achievement. Since being established, the Foundation has been meticulously engaged in charitable works assisting those less fortunate than others. Al-Khair has established overseas schools for orphans and shelters for widows and vulnerable women. The Foundation also constructs water-wells making fresh, clean drinking water accessible to remote communities. The 2005 Kashmir Earthquake saw the Foundation engage in its first overseas disaster relief aid mission. Al-Khair successfully distributed food, medicines, shelter kits and much needed moral support to survivors in difficult and dangerous conditions through its ground team operating in the region. The Foundation has now in place an effective aid mechanism and routinely engages in relief missions around the world. The Foundations role in supporting the victims of the recent Haiti earthquake was acknowledged by the United Nations. The Foundation also provides Hardship and Infrastructure relief going beyond basic provision of aid aimed at improving and in many cases rebuilding basic public services either nonexistent through poverty or destroyed by natural or manmade disasters and without which unimaginable human misery is caused. In 2009, the Al-Khair Foundation joined forces with IQRA TV, (free to air channel available on SKY 826) broadcast worldwide to Muslims and Non Muslims. In a short space of time, IQRA TV is now established as one of the premier broadcasters of quality Islamic based programmes that aimed at informing and educating. At the heart of the Al-Khair Foundation is its responsibility for harnessing and improving community relations and engaging in interfaith dialogue. Al-Khair is well known for its annual conferences where religious leaders and people of any and all faiths are invited to promote understanding, tolerance and harmony.